Pegasus is indeed a long distance away but its main stars are still well-known to night sky gazers. It is quite familiar to many astronomers that Pegasus is very rich in galaxies. In some of its regions the galaxies are so numerous that they cover the entire field of a telescope. 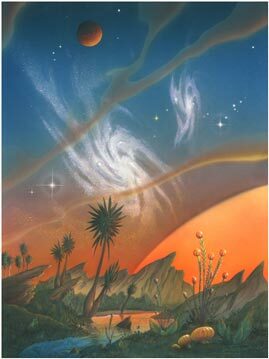 Here is represented a vision of what the evening sky might look like on some strange and alien planet near what in astronomical terms is called a red giant. A red giant is a dying star that has expanded to many times its original size. Over millions of years whole worlds might evolve life and terrain that bathes in its dim, red glow. The muted glare of such a star might allow some view of the distant space beyond it and in this case reveals various galaxies and stars. One might encounter very strange life forms and tree-like plants. The flowing streams may not even be water as we know it. Here some plants are structured like inflated balloon membranes, perhaps retaining special life-giving gases. Rocks and mountains might show a very violent geological history. This might be a very special world that has thrived in some unique and surprising ways in the advances of the expanding red giant.